Parliament may need to postpone the motion of no confidence debate planned for April 18. This comes after the Constitutional Court has allowed parties to file opposing papers in the United Democratic Movement’s (UDM) urgent application on the motion of no confidence debate against President Jacob Zuma. The Constitutional Court has issued directions to all parties wishing to oppose the UDM’s court application. The party approached the court on Monday after the Speaker of the National Assembly‚ Baleka Mbete‚ refused its request to have the voting on the motion conducted by way of a secret ballot. Parliament has indicated that it will oppose the UDM’s application and the Constitutional Court has now given it until midday on Thursday to file papers. The UDM then has until 4pm on Wednesday‚ April 19 to reply. “The parties must file their written submissions by 16:00 on Friday‚ 21 April 2017. 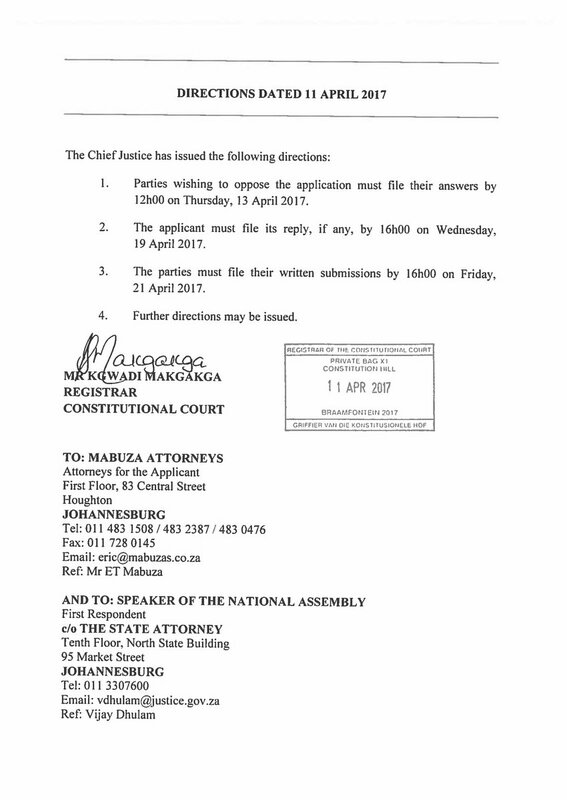 Further directions may be issued‚” the court said in directions issued by registrar Kgwadi Makgakga. UDM leader Bantu Holomisa took to Twitter to celebrate. The motion of no confidence is scheduled to be determined by the National Assembly on April 18. It is not yet clear whether this date will change in view of the UDM’s application‚ however, the UDM has approached Mbete for a decision. “We have already done that. We have given the speaker until tomorrow at 10am (to indicate whether the date will change). If she doesn’t do that then we will approach the court for an order‚” said UDM attorney Eric Mabuza. Holomisa said in court papers that whenever members of the National Assembly were called upon to elect the president‚ this must take place via secret ballot. It therefore follows that when members seek to express motions of no confidence in the president‚ a secret ballot must also be used‚ he argued. Holomisa said the rules of the National Assembly did not preclude the use of a secret ballot for a motion of no confidence. “This application does not seek to prescribe to the National Assembly how to run its affairs. According to Holomisa three opposition political parties indicated their desire to table motions of no confidence in the president following Zuma’s reshuffling of his Cabinet two weeks ago‚ which resulted in the removal of former finance minister Pravin Gordhan and his deputy‚ Mcebisi Jonas. Holomisa said the urgency of the motions of no confidence were critical in light of the country’s economic and political crisis. Two of the three ratings agencies have downgraded South Africa’s long-term foreign currency sovereign rating from investment grade to “junk” status since the reshuffle.